Social psychology has generated a wealth of empirically tested wisdom that can help policy makers and the public address the threat of terrorism. By understanding our propensities, among others, to “swarm and norm” in forming beliefs or take cues from others in the face of emergencies, we can develop more effective strategies and responses. Additional studies offer insight about how we form social identity, why people resort to terror and how we might diffuse long-standing historical grievances. Terrorism is as old as history and almost certainly older. In 68 B.C., for instance, the Roman city of Ostia, a vital port for one of the world's earliest superpowers, was set on fire by a band of thugs. They destroyed the consular war fleet and, rather embarrassingly, kidnapped two leading senators. Panic ensued—the same panic that has now been recapitulated down the centuries, courtesy of such terror groups as the Irish Republican Army, the Palestine Liberation Organization, the African National Congress, the Liberation Tigers of Tamil Eelam, al Qaeda and, most recently, ISIS. At the time of writing this article, the world had witnessed three major terrorist attacks within a period of 20 days—Beirut, Paris, San Bernardino—which were quickly followed by additional atrocities in Istanbul, Kabul, Dikwa, Nigeria, and elsewhere, each committed by Islamic extremists. And just as 19th-century German historian Theodor Mommsen described the culprits at Ostia as “the ruined men of all nations” forming “a piratical state with a peculiar esprit de corps,” political leaders today typically resort to describing terrorists as insane, deranged or purely evil. So what have psychologists had to say about the problem? Quite a lot. But their cool-headed observations seem to have been drowned out by the all-too-familiar chorus of senators, celebrities and others waging their own rhetorical jihad against Islam. As we continue to grapple with the challenge of violent extremism, perhaps we should all take a brain check. Instead of lip-synching to the shrill braying of polemical pundits and belligerent blowhards, maybe we should tune in to the quieter, more discerning notes emanating from some of our laboratories. Granted, science and politics have often made uncomfortable bedfellows. History attests to a regrettable roll call of impromptu trysts between the two spawning inhumane ideologies. Consider the brutal abduction of mainstream evolutionary theory by genocidal Aryan supremacists and its grotesque rebranding—through the medium of social Darwinism—as Nazi doctrine. In the face of a rising tide of violent extremism, though, it would seem remiss if we scientists simply sat back and did nothing. 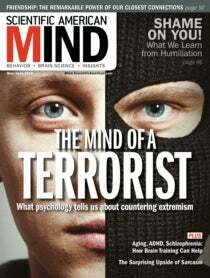 So in this article, we step up to the challenge of placing social psychology center stage in the war on terror. We will not pretend it was easy: over the years the field has generated a considerable body of empirically laundered wisdom. But after lively discussions with an international group of experts, we have homed in on seven exemplary studies across an eclectic array of research areas—from social cognition to conflict resolution. We believe each has direct implications not just for policy decisions but for all of us as individuals in a fast-changing world. OVERVIEW: “Always remember that you are absolutely unique,” quipped cultural anthropologist Margaret Mead. “Just like everyone else.” She was spot on. Don't we all assume that we’re “normal”? This classic study examined how susceptible we are to the delusion that our choices, judgments, feelings and beliefs reflect what others think as well. METHODOLOGY: The investigators presented college students with real and hypothetical tasks (would they, for example, be prepared to wear a sandwich board around campus as part of a study on attitude change?) and asked them to indicate their responses. They also asked them to estimate the percentage of other students who they thought would respond in the same way. FINDINGS: The participants were consistently of the opinion that their own personal judgments broadly represented their fellow students’ views. This now well-established effect has become known as the false consensus bias. IMPLICATIONS: This experiment provided incontrovertible evidence that when it comes to “being ourselves,” we humans like to have our cake and eat it, too. We revel in the idea of being our own person, but our brain is hardwired for group living. So natural selection came up with a nifty little app that affords us the illusion of being just like everyone else. It tells us that our behavioral choices are rational and appropriate while offering us the sociocognitive autonomy we crave. Most of the time, it works just fine: Ever wonder why politicians often display such bizarre, unfounded optimism in the run-up to elections? But occasionally, when a little militant conviction metastasizes into a malignant ideological tumor, the illusion of consensus can prove deadly. It is especially dangerous within groups; in the absence of any challenge from other points of view, the tumor can quickly turn aggressive. Politicians and the public must be willing to question their assumptions—about terrorism, about immigration, about religion—lest they fall into a trap of false consensus. OVERVIEW: Why do people sometimes do nothing in the face of danger? This hall-of-famer study from the annals of social psychology investigates the powerful and surprising effect that the presence of others has on decision making in emer-gencies. To take action, an individual must first notice an event, interpret it as an emergency and take personal responsibility to intervene. The study shows how group dynamics can break the links in that chain. METHODOLOGY: Male undergraduates assigned to complete a questionnaire find themselves in a room that begins to fill with smoke. They are alone, in groups of three, or accompanied by two others who are in on the experiment and do not react. Will someone leave the room to report the smoke? FINDINGS: About 75 percent of the participants left alone reported the smoke, compared with only 38 percent of those in groups of three. What about the subjects accompanied by blasé study accomplices? A mere 10 percent of these eye-rubbing, smoke-waving stoics raised the alarm. IMPLICATIONS: This study demonstrates that we reference others for any kind of behavior that may depend on unfamiliar actions or decisions. Unfortunately, emergencies often begin as ambiguous, potentially innocuous situations. And because most of us are enthusiastic proponents of embarrassment evasion, we look to the actions of others to inform our own. If they don't act, we don't act. We would all benefit from regular reminders so that our lemminglike tendencies did not stand in the way of foiling a terror attack. Similarly, within an extremist group, the same inhibition may be at work, stopping members from questioning outrageous acts, which then become the norm as time goes by. METHODOLOGY: The investigators presented a classic optical illusion, the autokinetic effect, to a group of six participants in a pitch-dark room. In this illusion, a stationary point of light appears to move around in different directions for about 15 seconds. Over a series of trials, the participants had to estimate out loud the farthest distance they thought the spotlight reached from its starting point. But there was a catch. Half of the group were secret agents, briefed by the researchers to extend the judgments of a real participant by five centimeters. In addition, the experimenters subtly manipulated the social identity of some of these secret agents so that they more or less resembled those of the genuine participants. Would group “belongingness” cause the participants to increase their estimates to match those of the infiltrators? FINDINGS: Absolutely! The greater the obvious differences between the participants and the secret agents—how much they appeared to belong to different social groups—the greater the disparity in their estimates. IMPLICATIONS: There are two take-home messages here. The first is that we follow the examples of those we identify with and disregard everyone else. Thus, policy framing around social differences is crucial. It is all very well for moderate, middle-aged imams to denounce fanatical, young fundamentalists, but since when has youth ever identified with establishment? Second—and community and religious leaders take note—when we are not sure what to make of a given situation, we rely on those in our own social groups to decide what constitutes an appropriate response. In a healthy cultural melting pot, this is fine. But when groups start becoming isolated from conventional society, this innate propensity to “swarm and norm” can form a springboard for cliques, cults and other kinds of extremists. Two things follow: First, our leaders must actively seek evidence and advice from experts outside their own groups. Second, they should try to find ways to stop the isolation of groups drifting toward extremist ideology. OVERVIEW: As mentioned earlier, we humans are hardwired to be part of a group. But just how fastidiously natural selection managed to install our tribal circuitry, and how easily its switches are flipped, was not at all apparent until this classic paper fiendishly put the Klees among the Kandinskys. METHODOLOGY: Volunteers evaluated unfamiliar, uncredited artwork and were then divided into two groups on a completely trumped-up, arbitrary basis: half were told the paintings they preferred were by artist Paul Klee; the others heard they preferred the work of Wassily Kandinsky. In truth, the assignments were completely random. Once placed in these meaningless, zero-calorie groups and without knowing who else was in them, each participant was given an entirely unrelated task: allocate points—which translated into money—to two fellow study subjects. These compatriots remained anonymous except for the following identity tags: of the Klee group or of the Kandinsky group. Would the simple fact that the participants were members of one group as opposed to another influence their allocation of points? FINDINGS: The participants liberally doled out points—and the prospect of financial reward—to members of their own group and steadfastly withheld points from those in the other group. Equanimity went out of the window. It was “my lot versus the other lot.” Period. IMPLICATIONS: It is not difficult to appreciate the power of in-group bias. All you have to do is turn up at a football game or log on to Facebook. But what is not so amenable to common sense, and what this paper demonstrates so elegantly, is that such loyalty can be harvested without a lifetime's allegiance to the Broncos, the Giants or the Eagles—or Islam, Christianity or Judaism, for that matter. Categorizing people into what are known as minimal groups—those lacking any distinguishing features apart from a name—is sufficient to awaken an immediate, perhaps ancestral desire for positive in-group distinctiveness. The mind-set of us versus them—the psychological ground zero for all discrimination and prejudice. The challenge for policy makers is to harness this built-in motivation to be part of the “dream team” to the benefit of society. We need strategies that reduce the psychological fit of the us-them distinction. Research has given us plenty of ammunition: focus on everyone as unique individuals; focus on the super us, a category that binds everyone into a single group (humans, for example); or zoom in on the panoply of us categories that intersect the them categories (gender, age and nationality, for instance, even a passion for basketball). All these approaches can help eradicate the tendency people have to bet their entire psychological savings on that one single hand of existential poker. OVERVIEW: Many people are highly committed to causes that “matter,” but few go so far as to give their lives for them. What distinguishes these ideological extremists? According to this paper, the boundaries between their individual and group identities have become blurred. METHODOLOGY: The researchers compared two types of Spaniards: those whose personal identities were or were not “fused” with their national identities. The volunteers faced three versions of a self-sacrificial form of the classic trolley problem: Five Spaniards, five fellow Europeans or five Americans are about to be killed by a runaway trolley. If you jump off a bridge into the trolley's path and die, though, the five will be spared. In a fourth study, they were asked: Would you allow a fellow Spaniard to jump to his or her death to kill five terrorists, or would you elbow the person aside and jump yourself? FINDINGS: The participants with fused identities were far more likely to sacrifice themselves to save their countrymen, compared with those with nonfused identities. This “moral imperative” informed the fused participants’ decisions to preserve the lives of Europeans, too—members of an extended in-group for them—and to sacrifice themselves in place of a compatriot to eliminate five terrorists. When it came to averting American, or out-group, fatalities, however, their moral conviction evaporated. IMPLICATIONS: Horrifying suicide attacks are becoming increasingly common. But claims that those who commit such acts are either hole-in-one psychopaths or brainwashed dissidents miss the fundamental psychological element that leads them to mass murder. This research shed a powerful light on the matter. For some people, the usual process of identifying with a group devolves into a kind of transcendent state—one in which their individual sense of cognitive, emotional and moral agency becomes totally immersed with the prevailing imperatives of the collective. They become depersonalized to the point that they see suicide as an act of self-salvation of their fused-group self. The central message for policy makers and other professionals is that identifying such personalities and developing intervention programs—through schools and counselors and within our organizational and institutional structures—designed to unfuse self-identities or prevent fusion in the first place could significantly reduce the risk of political or religious martyrdom. OVERVIEW: Perhaps unsurprisingly, we do not like it when members of our own in-group criticize our posse's attitudes, beliefs or behaviors. But how would we react if we were members of an out-group? This research shows that when a competitor of ours takes one of its own to task, it can significantly boost our sympathy for that group's cause. METHODOLOGY: The researchers presented Israeli participants with a variety of fictitious United Nations reports on the Israeli-Palestinian conflict. The summaries differed in three important ways—whether they included any criticism of Palestinian conduct toward the Israelis; whether that criticism was voiced by a Palestinian official or an “outside” source from Europe or China; and whether the criticism was about the conflict or not. Would critiques of Palestinian policy from Palestinians themselves attenuate hard-boiled Israeli attitudes toward them? FINDINGS: The answer was a qualified yes. Participants who read Palestinian self-criticism—regardless of whether that criticism was conflict-related or not—came to see the Palestinians as being more open-minded than those who read statements of disapproval from Chinese or European sources or those who saw no criticism at all. They became more understanding of the Palestinian perspective on the situation, more hopeful of finding a peaceful resolution and more willing to explore the possibility of compromise. IMPLICATIONS: Within the current climate of cultural polarization, the results of this study are as significant as they are surprising. In-group censure may well come at a price for the renegade turncoat. But as a means of opening doors—of offering a psychological olive branch to a wary out-group and of breaching the fortifications of militant, entrenched beliefs—it should not be underestimated. Islamic leaders, listen up! Your public criticism of terrorist atrocities committed by Islamist fundamentalists can positively impact Western public opinion of mainstream Islam, challenging prejudicial stereotypes. Likewise the more transparent U.S. and European authorities are when publicly debating the wisdom of their foreign policy, the more sympathy they will engender among Muslims who harbor festering suspicions about Western imperialist motives. OVERVIEW: How can we get past historical grievances between groups? This unique longitudinal field study revealed how an unorthodox intervention could help break down the inflexible sociopsychological barriers inherent to the Israeli-Palestinian conflict. METHODOLOGY: A control group of pro-Israeli supporters watched a neutral Israeli tourism video. Another group was primed to think “paradoxically” about the Palestinian conflict: specifically, they watched videos that endorsed a perspective consistent with their own but taken to an extreme. For instance, the videos espoused ideas such as “We need the conflict to have the strongest army in the world.” Would such irrational hyperbole prompt them to reconsider their original position? FINDINGS: This so-called paradoxical intervention, conducted in the run-up to the 2013 Israeli general elections, softened participants’ attitudes toward the Palestinian problem. It even influenced how they intended to vote, increasing the chance they would support parties interested in making peace. IMPLICATIONS: In some circumstances, an effective antidote to extremist philosophies might be to “see” proponents’ attitudinal stances and then “raise” them. For instance, to counter extreme fundamentalism, more moderate religious leaders might debate individual extremists on the argument that “women should never be allowed to leave their homes.” These kinds of ideologically consistent but practically absurd extensions of faulty principles could help force people to reappraise their thinking. The insights generated from each of the studies we have described are either supported by or have, in turn, precipitated a wealth of well-tested theories and additional evidence. As such, they offer policy makers a powerful perspective on how to contend with the threat of terrorism. Of course, scientific theories are sometimes derailed. But social psychology offers some of the best tools we have for understanding human behavior. It is a remarkable indictment against the edicts of common sense that when seeking to divine the best way forward, many politicians and policy makers still put their faith in the garbled outpourings of soothsaying pollsters and op-ed oracles over scientific analysis. Social Identifications: A Social Psychology of Intergroup Relations and Group Processes. Michael A. Hogg and Dominic Abrams. Routledge, 1988. Terrorism: A History. Randall D. Law. Polity Press, 2009. Political Polarization Projection: Social Projection of Partisan Attitude Extremity and Attitudinal Processes. Leaf Van Boven, Charles M. Judd and David K. Sherman in Journal of Personality and Social Psychology, Vol. 103, No. 1, pages 84–100; July 2012. Terrorism as Self-Help Justice. Michael Shermer; Skeptic, Scientific American, May 2015. Kevin Dutton is a research psychologist at the University of Oxford and author of two popular science books, Flipnosis and The Wisdom of Psychopaths. Dominic Abrams is a professor of social psychology and director of the Center for the Study of Group Processes in the school of psychology at the University of Kent in England.